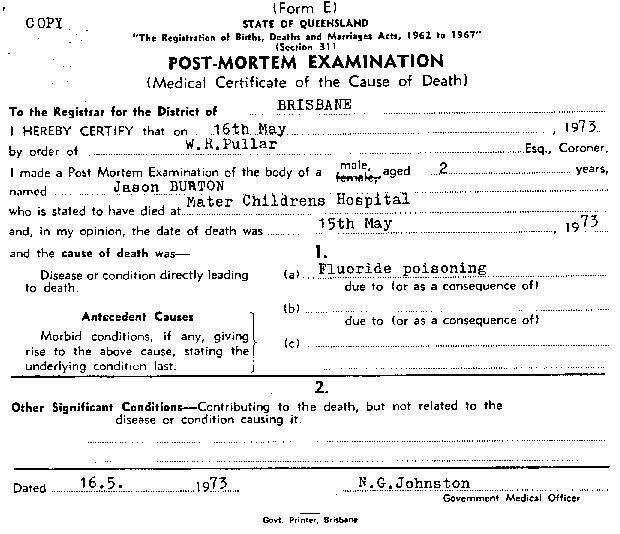 … yet “authorities” claim no person in Australia ever died of fluoride poisoning. My husband and I have agreed on writing this letter in the hope that it may prevent someone going through the experience we suffered in May 1973. In July 1970 we were told by our doctor that we were going to have a baby. In my first visit to the Hospital for a check-up in October, I was told by the Matron to start taking fluoride tablets for the benefit of the baby. I did so until the 20th of February 1971 when our first child, Jason, was born. When he was one year oild the welfare clinic told me to start giving him 1/2 of a fluoride tablet per day. I did so for 15 months. When he was 27 months old he got hold of the fluoride tablets, and at the time I didn´t know how many he had eaten, but I knew it wasn´t many. I took him to the doctor straight away and he gave our son a stomach pump treatment. The doctor told me he could only find four tablets in his stomach. I was told to take him home and he would sleep for a while, but he would be okay when he woke up. This was at 2:00 P.M.
At 5:30 P.M. I realized that something was wrong, as I couldn´t wake him. I rang the doctor and was advised to take him back to the surgery. The doctor saw him staright away and told me to take him to the maternity hospital. As we arrived he was still unconscious and he stopped breathing. The doctor put him in a respirator immediately. The doctor and the nurses didn´t believe that he could be so ill from taking fluoride tablets until they did some test on him. They told us it would take 200 to 500 tablets to make him so sick. There were less than 100 tablets in the bottle before he touched it. On May 15th, five days after admission, Jason passed away. 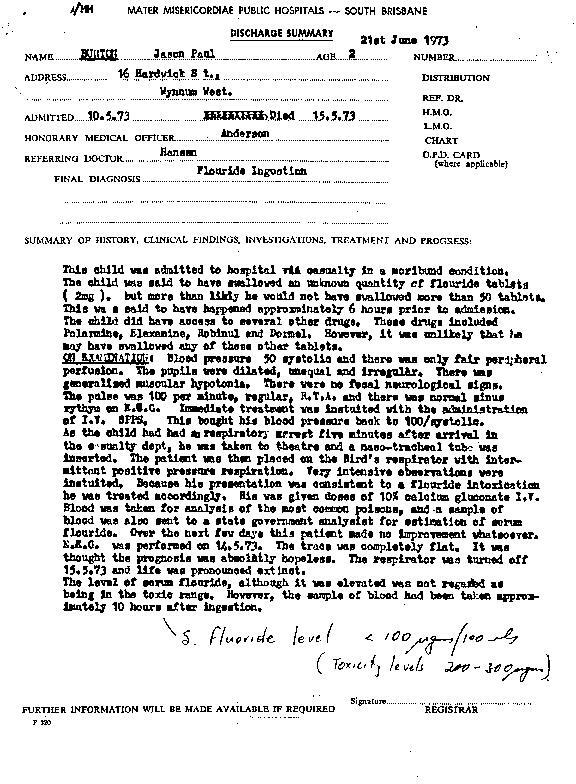 The doctor verified that his brain, due to fluoride poisoning, was completely dead. We have now two children. They have never or will never receive fluoride tablets from us. We are completely against fluoridation of drinking water and we hope that this letter will help stop such a thing from happening. At least three fatalities have occurred due to the fact that the toxicity of fluoride is often underestimated. One case report may be cited. A boy aged 27 months swallowed an unknown quantity of fluoride tablets containing 0.5 mg each. As the bottle contained less than 100 tablets, the unconscious child was sent home after a gastric lavage yielding 4 (!) tablets only, with the assurance to the parents that no risk existed. Three and a half hours later respiratory failure began to develop and the child was hospitalized; he died five days later. Even at the hospital the parents were told that 200 to 500 tablets would be required to endanger the child. A spokesman for the Queensland Justice Department confirmed that Jason´s death was caused by fluoride poisoning. He said the death certificate was authentic. It records the cause of death as fluoride poisoning. The document you sent me for verification is false. I have spoken with the Department of Justice in Queensland, and they stated that they never made such a statement. The Poisons Advisory Department in the Royal Children´s Hospital in Sydney, keeps a record of all people poisoned in Australia. 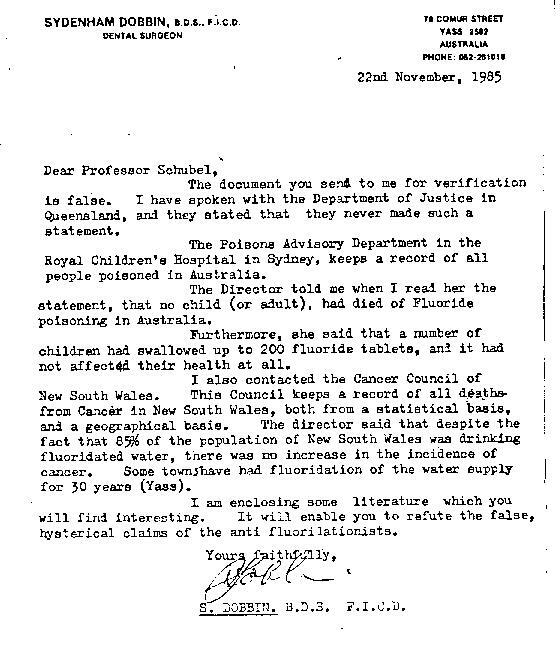 The Director told me when I read her the statement, that no child (or adult), had died of fluoride poisoning in Australia. Furthermore, she said that a number of children had swallowed up to 200 fluoride tablets, and it had not affected their health at all. I also contacted the Cancer Council of New South Wales. This Council keeps a record of all deaths from cancer in New South Wales, both from a statistical basis, and a geographical basis. The director said that despite the fact that 85% of the population of New South Wales was drinking fluoridated water, there was no increase in the incidence of cancer. Some towns have had fluoridation of the water supply for 30 years (Yass). I am enclosing some literature which you will find interesting. It will enable you to refute the false hysterical claims of the anti fluoridationists. Police Officers attending P.M.___________ Constable Kennedy, Woolloongabba__________. The larynx, pharynx and trachea appear normal. The pleural cavities are clear. Both lungs show moderate congestion and oedema. Both kidneys appear normal. The adrenals and thymus gland appear normal for age. COMMENT:No pathological change which could have caused death could be found in any organ at the post mortem examination. However, the autolysis of the brain tissues was so marked that any evidence of a disease such as encephalitis would be impossible to find. 1. The history of fluoride overdose. 2. 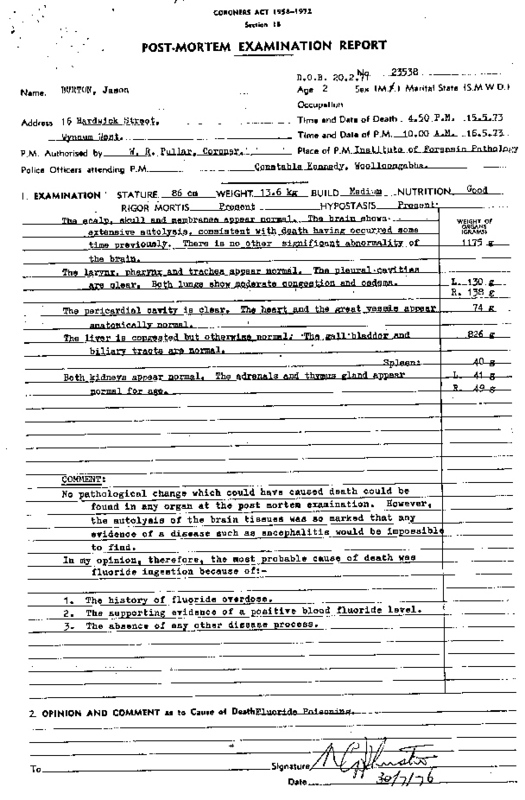 The supporting evidence of a positive blood fluoride level. 3. The absence of any other disease process. This child was admitted to hospital via casualty in a moribund condition. The child was said to have swallowed an unknown quantity of flouride tablets (2 mg). but more than likely he would not have swallowed more than 50 tablets. This was said to have happened approximately 6 hours prior to admission. The child did have access to several other drugs. These drugs included Polarmine, Elexamine, Robinul and Dormel. However, it was unlikely that he may have swallowed any of these other tablets. On EXAMINATION: Blood pressure 50 systolic and there was only fair peripheral perfusion. The pupils were dilated, unequal and irregular.There was generalized muscular hypotonia. There were no focal neurological signs. The pulse was 100 per minute, regular R.T.A.and there was normal sinus rythym on E.C.G. Immediate treatment was instuited with the administration of I.V. SPPS. This bought his blood pressure back to 100/systolic. As the child had had an respiratory arrest five minutes after arrival in the casualty dept, he was taken to theatre and a naso-tracheal tube was inserted. The patient was then placed on the Bird´s respirator with intermittent positive pressure respiration. Very intensive observations were instuited. Because his presentation was consistent to a flouride intoxication he was treated accordingly. He was given doses of 10% calcium gluconate I.V. Blood was taken for analysis of the most common poisons, and a sample of blood was also sent to a state government analysist for estimation of serum flouride.Over the next few days this patient made no improvement whatsoever. E.E.G. was performed on 14.5.73. The trace was completely flat. It was thought the prognosis was absolutely hopeless. The respirator was turned off 15.5.73 and life was pronounced extinct. The level of serum flouride, although it was elevated was not regarded as being in the toxic range. However, the sample of blood had been taken approximately 10 hours after ingestion. Next Post Is Dementia Caused By Aluminum Through Fluoridation?